Happy Sunday everyone.. It's time for a new challenge at MakerPop and this Month we are changing things up a bit. Challenges will start on Sundays and end the Following Friday. We will pick one of our Top Picks to join us as a Guest Designer for the next challenge as well!! 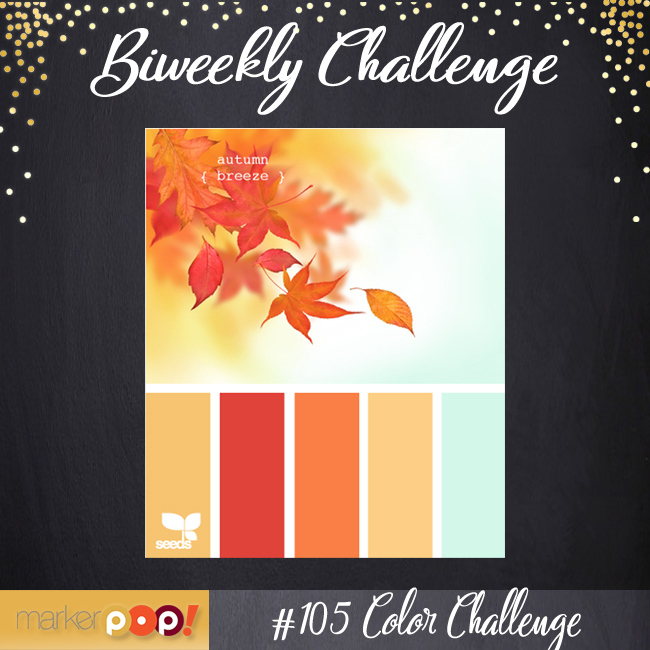 This week it's our first Color Challenge... I'm using the Gorgeous new set from Concord & 9th Lace Leaf and the Grateful Leaf die set. I stamped the background image using Spiced Marmalade, Mustard Seed and Barn Door Distress Inks on a piece of watercolor paper. Then I added some Tumbled Glass around the background for a small pop of Blue. I stamped the Leaf image and embossed it in Gold as well as the For You sentiment. Then I adhered the panel to a Blue card base. Then I die cut the Grateful sentiment from some Neenah Solar White card stock and adhered it to the leaf image with some Glue. I wanted a little more gold so I added some Pretty Pink Posh sequins. The challenge is open until Friday Oct. 14th.. We hope you will join us!